I used this menu in third grade (though it could be adapted easily by other grade levels as well), and the students, parents, and administrators loved it! I love menus for differentiating and allowing student choice with guidelines in place. The freebie menu packet below comes with a basic plain template with no graphics, along with 12 other monthly “themed” pages, in case you want to change things up a bit to liven it up. 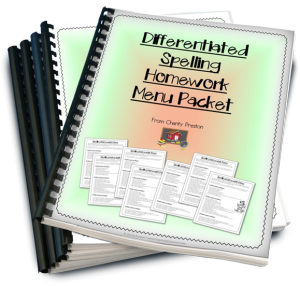 Want your own copy of the Differentiated Spelling Homework Menu Packet?